Editing can be a joy or a challenge. I’ve worked with several unpublished writers with whom my relationship has been nurturing and excellent. They have been willing learners and I’ve seen great improvement in their writing as we worked together. And then there have been the challenges. Some writers think their writing is so good that no editor is needed, but others know that they should get an editor…they just don’t understand the role of the editor. As I explain immediately, I am part cheerleader and part trail guide. I will cheer them as they write, but I will also guide them on the path to improve their writing. I’m a writer. I understand writers’ egos. We bleed over our writing. Every word is precious. I get it. 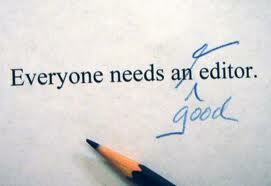 And I think that’s what makes me a good editor. I know the pain of word-birth. Two weeks ago a “writer” contacted me out of the blue. He said he’d been working on his manuscript for many months and wanted to work with a writing mentor. He’d seen my profile on an editing website and thought I had the skills he needed. I offered to read and assess his manuscript, which he assured me his friends had read and loved. I should have known to walk away at that moment. Still, I cautioned him that an editor reads differently than friends read, and said that he shouldn’t expect simple applause from me. If applause was due, I’d certainly give it, but I was also going to read to find ways to improve the book, if it needed improvement. That’s the purpose of the assessment read. He assured me that he understood. Well, he wrote decent sentences, but the story and plot needed a great deal of work, and his characters were cookie-cutter, trite and stereotypical. I broke this to him with great diplomacy, but he fought me every inch of the way, arguing about why he had written as he had–and anyway, he’d fashioned his character on Tom Cruise’s interpretation of Lee Child’s Jack Reacher, so such characters do exist. Ultimately, he decided he couldn’t work with me. His friends had loved what he’d written, and they didn’t have to ask so many questions about who people were and why they did what they did. And, furthermore, who was I to question his grammar? He’d run the thorny sentences through a grammar checker online and had been assured his grammar was fine. 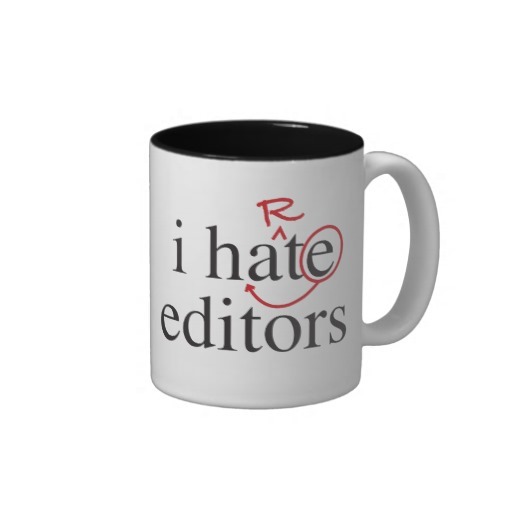 Heck, I’m just an editor. What do I know? After numerous, increasingly argumentative, emails, I was more than willing to call quits on our nascent relationship. He was simply going to be ore trouble than he was worth. I wasn’t ready to debate every point (and had given him my willing permission to accept or decline every assessment comment I’d made). We parted company, with him declaring that he had actually made many of the changes I had suggested, and was thinking about many of the story points I’d highlighted. I said if he needed my help in the future, I was here. After two weeks, I requested payment for the assessment (which I usually ask for up front, before delivering said assessment). He refused. Said he thought my feedback was crap, and anyway, HE was assessing ME, and decided he didn’t want to work with me. So, he wouldn’t pay. Excuse me? I’m not sure what planet he lives on, but I hope publishing is different there, because he’s never going to get published here on Earth. Unless he self-publishes, which is his only possibility. Sorry you had such a bad experience. I also have a client who hasn’t paid and is miserable to work with and yet somehow I keep working for him knowing it will turn out to be a disaster in the end … in fact it is already. In any event if I ever finish my manuscript I’d love to have you give it some tough love … but I have to finish writing it first! This experience is often overshadowed by fabulous experiences. Which is why I continue to love my vocation/avocation. If you finish, I’m here. If you don’t finish, and want companionship, I’m here! Here’s to writing!